TOKYO — A U.S. Marines commander in Japan has asked service people in the southwestern region of Okinawa to keep a low profile to show respect after a sailor allegedly stabbed a Japanese woman and then killed himself, the latest in a series of crimes that have outraged residents. "As a sign of respect to a community that is angry and in shock, we should be unobtrusive," Lt. Gen. Eric Smith said in a letter dated Sunday. The letter was made available Monday by a U.S. military official. The letter, addressed to base leaders, asked everyone to avoid unneeded shopping, eating out or being overly loud so as to "demonstrate solidarity with our Okinawan neighbors." The U.S. military identified the sailor as Gabriel A. Olivero from North Carolina. Japan's Foreign Ministry said the sailor stabbed the woman and killed himself Saturday. Okinawan people have long resented the heavy presence of American troops, including the resulting crime, aircraft noise and accidents, and destruction of nature. "It's just the decent, right, and neighborly thing to do," Smith said in the letter, while noting that most American troops are doing good work and he was not asking them to hide or be ashamed. Although Okinawa accounts for less than 1% of Japan's land space, it hosts about half of the 54,000 American troops stationed in Japan, and is home to 64% of the land used by the U.S. bases in the country under a bilateral security treaty. 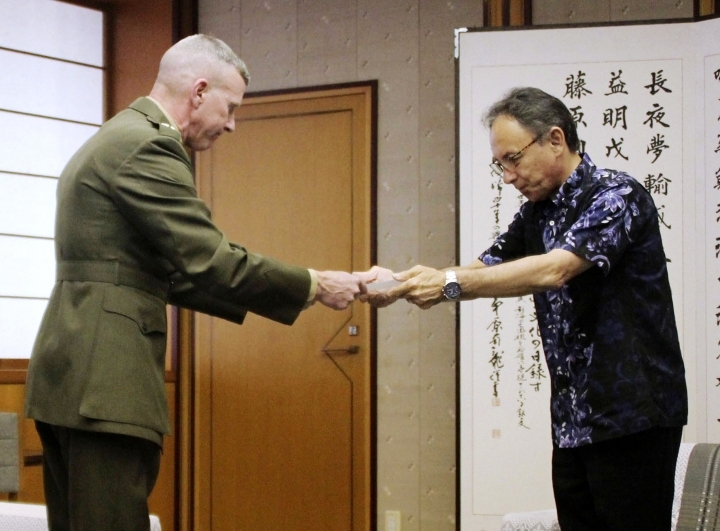 A plan to relocate a Marine Corps air station called Futenma to a less populated part of Okinawa has also been contentious. Denny Tamaki, who was elected Okinawa's governor in October, is pushing to have the base moved off the island. Tamaki met with Smith on Monday to discuss the need for more efforts to contain crime by U.S. service people on Okinawa.